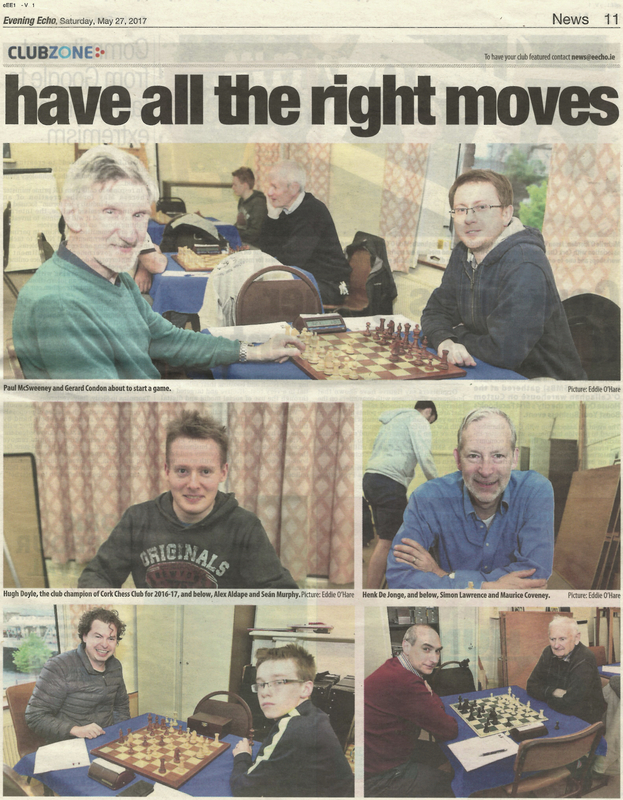 The Munster League started back up again in Charleville last weekend. The B team were in action and in the first game lost 4 1/2 to 1/2 against the Cork A team. In the second game we shared the spoils with Charleville. 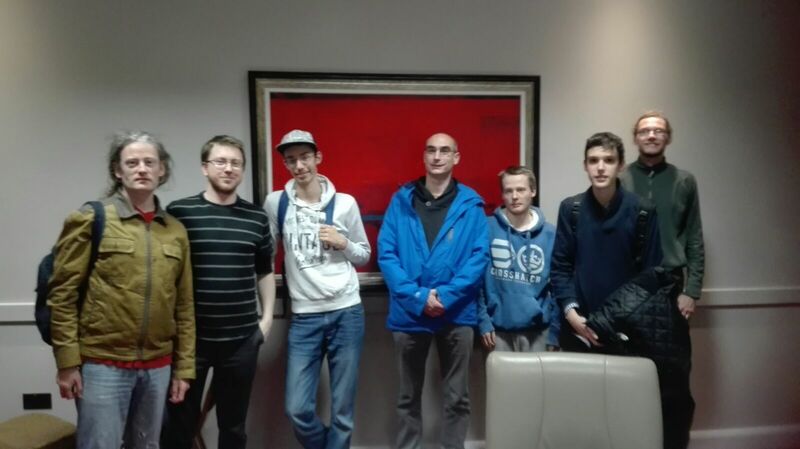 For the first game we were treated to the luxurious conditions that the A team expects - leather seats, wooden boards and pieces. No expense spared! I had a mixed game in a Rubinstein French. I was well prepared and only used the increment for the first 20 or so moves and built up a huge time advantage against my much higher rated opponent. This was especially useful later once I started to make my customary blunders as my opponent didn't have a great deal of time to find the best moves! I got a comfortable, equal endgame position and then hallucinated that my opponent was winning a piece. I made some terrible moves and ended up losing most of my pawns giving my opponent had an massively winning position. Luckily for me he failed to find the win and I managed to trade into a Rook & split a and c pawns against a Rook endgame. I had done a great deal of work on my endgames recently with Jesus DeLaVilla's 100 endgames course on Chessable so I was fairly confident here. I held out for 50 moves and only gave one winning chance around move 85. Again my opponent failed to find this and I escaped with a draw. For the second game we were back slumming it with the typical B team standard. No more leather chairs, plastic sets! I got a bit confused out of the opening against my opponent and ended up in a blocked position. I decided to swap my bishop for his knight as I felt that an extra knight would be better suited to the position. I ended up getting a really strong position - probably winning as I was up a piece. However then it all fell apart for me. My opponent got a really strong attack with his queen and my pieces were forced into awkward positions. I missed the fact that I could get my queen to e7 via a check on c7. If I had found that I think I would have converted the game. My opponent offered a draw but I felt that as the match result was hanging on this I should try to play on. Naturally I blundered into to a losing position but fortunately got back to draw in the end. Some great videos on rook and pawn endings covering rook pawn + 3vs3 and rook pawn vs 4vs4. Excellent article on Checkers World Champion Marion Tinsley and Jonathan Schaeffer's quest to solve the game. 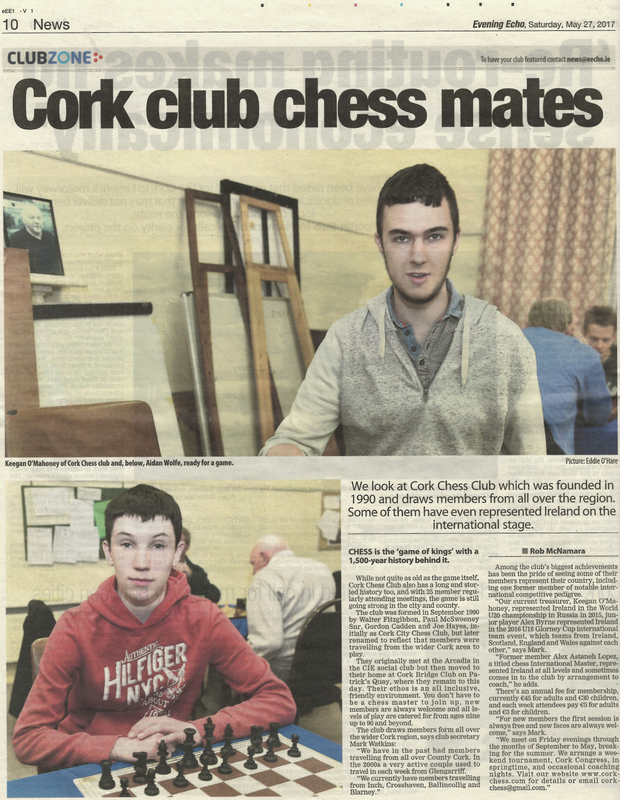 The Evening Echo did a piece on the Cork Chess Club recently for its Clubzone feature. I've posted it here (with permission from the Echo). For pdf format go here and here. The Bongcloud opening. I love this. Last night in the club we had an entertaining attempt at trying to mate with two knights against a king and pawn. This is a really tricky mate. You have to blockade the pawn, drive the king to the corner using just one knight and king, almost stalemate him there and then bring your blockading knight over to mate just before his pawn queens. It seems impossible. I played it out on Shredder tablebases and some of the moves seemed very unintuitive - e.g. moving the knight away from the king. You would never find them over the board. However I did see some common mistakes from people trying to win this and here are some plans for the defending side. Keeping the king close to the pawn was sucessful for a while. It took a lot of moves to drive the king away. Once the king is driven away then head for the side of the board furthest away from the pawn so that the knight blockading it is unable to attack the king. A common mistake by the attacker was to move the blockading knight before the king was trapped in the corner. In that case push the pawn. It is very hard for the knight to get back in front of it and he will probably have to just capture it and draw the game. If you are ever not in check and can push the pawn then push it. Based on the our attempts I feel confident in saying that if I was defending this position, I would be happy for my opponent to consult the entire room and still still bet on him not mating! Munster League Division 1. Round 14. My results in the Munster League since Christmas have by and large been terrible and I finished up in the final round in the same manner by losing as black. Looking back on the game I made some bad strategic mistakes that I thought I'd dealt with in these types of positions. I went back to aimless developing moves instead of urgent action on the queenside. I need to do some work on memorizing opening plans so that I don't make similar mistakes in future. The AGM after the game was very interesting. I'd never been at one of these before. There are big changes planned for the league in the coming years with a shift to two six team divisions. This will be a positive change for us as I think we will enjoy more challenging in a competitive division 2 instead of bringing up the rear in division 1.